So we got hold of some yellow fin tuna on offer. Just one thing when you buy tuna, please make sure it is responsibly sourced. I won’t start preaching here, but I think in comparison it is more important (if these things can be compared) than a free range chicken. As we all know the damage to our seabed trawling can do. Anywho, back to the recipe! In a flat bowl, mix the soy, http://premier-pharmacy.com miring, sugar and ginger juice together. Add the tuna and make sure the fish is coated with the marinade. Leave to marinade in the fridge for half an hour. Heat the oil in a large frying pan over high heat, sear the tuna for 2 minutes each side. Get it out of the pan and leave to rest on the chopping board. 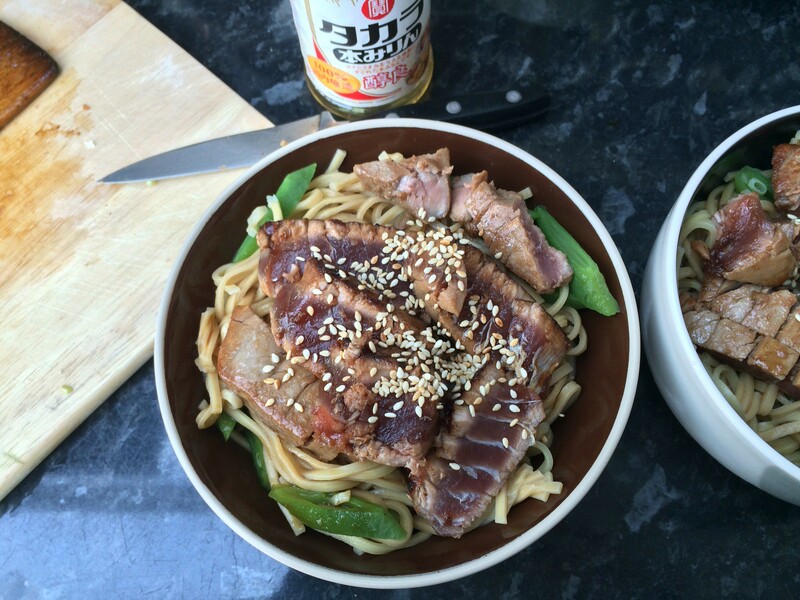 While the tuna is searing, prepare the sauce and noodles. Simmer the marinade over a medium heat for 3 minutes or so, until slightly thickened. Meanwhile bring a pan of water to the boil and plunge the noodles in to cook. Drain the noodle when it's ready. Slice the tuna against the grain into strips. Assemble: In your prettiest bowl, lay a bed of noodles down, then put the tuna on top, pour over marinade and sprinkle with spring onion and sesame seeds.